Partition lost is caused by many reasons, for example, incorrect operations, repartition disk, partition software goes wrong, partition deletion, partition table damaged, virus, etc. Typical features of partition lost are: partition's drive letter is missing in My Computer and the partition is shown "Not assigned" in Disk Management. The lost partition and its files can not be seen by the operating system. 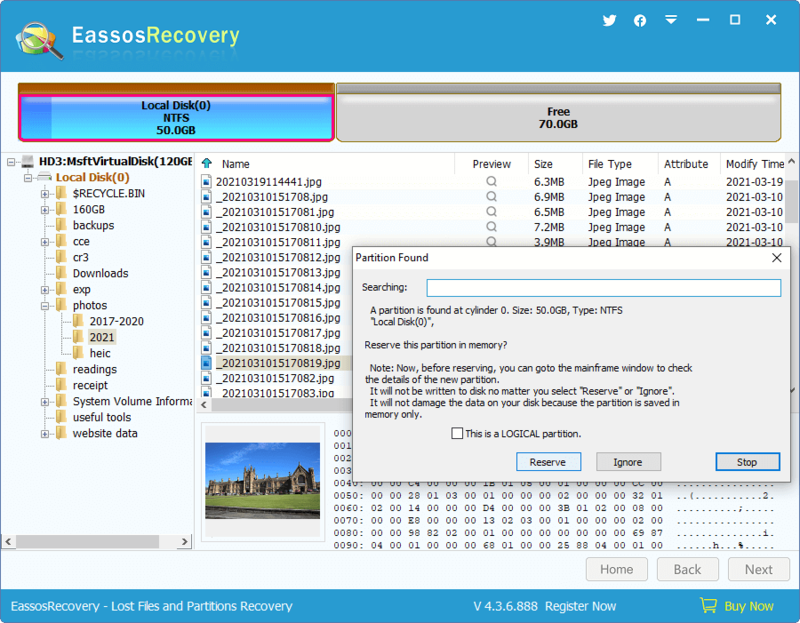 In many cases, as long as there is no further damage the lost partition can be recovered by Eassos Recovery. Partition's information like size, type and location is saved in partition table; when a partition is deleted, partition information mentioned above will be deleted from the partition table, but data in the partition won't be deleted. Therefore, when a partition is lost it is possible to recover its information by certain techniques. Eassos Recovery provides such a function. 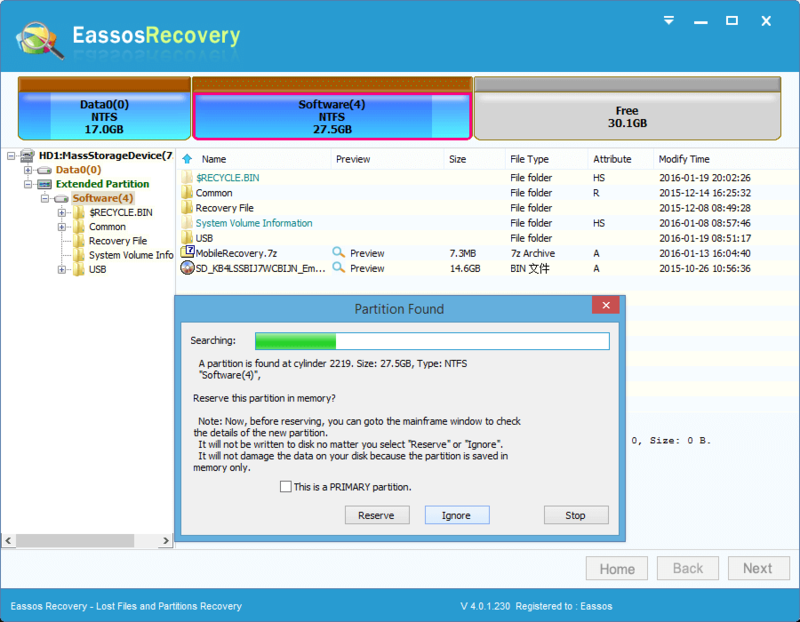 Comparing with other partition recovery software, Eassos Recovery has its unique techniques. 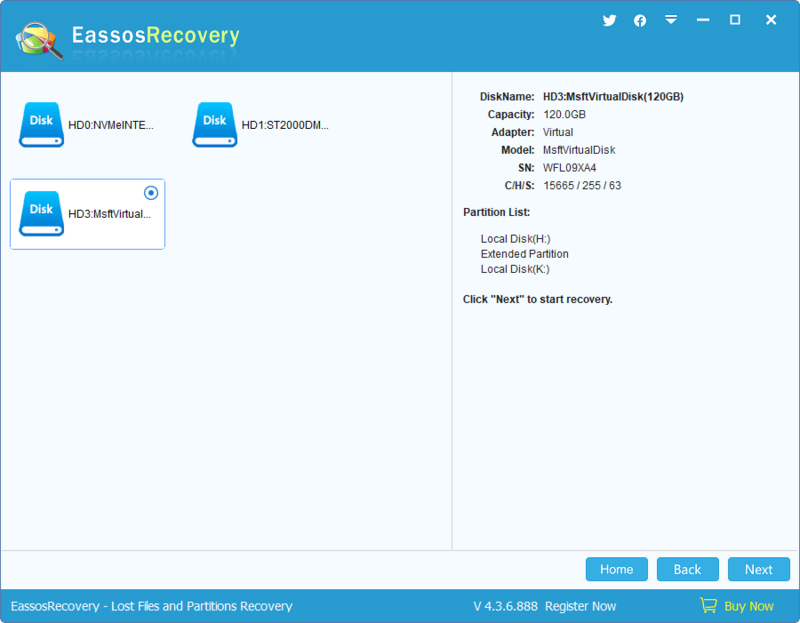 When Eassos Recovery finds out a lost partition it displays all the properties and files of the partition so that you can browse files and folder and judge whether the partition is correct. The lower-right corner is the preview image of pictures and Office documents as well as the hexadecimal format data of every file. During the searching process, all the information is saved in memory not the disk which can prevent further damage caused by incorrect operations. Detailed information is shown in the following part. To recover lost partition, please click the button "Recover Lost Partitions" on the main interface. 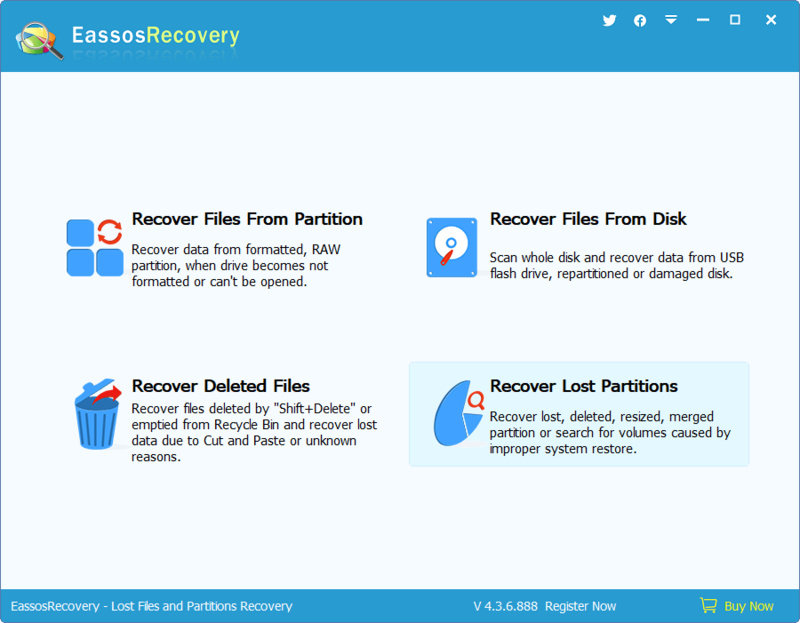 Eassos Recovery finishes the recovery in 3 steps: Select Disk, Search For Lost Partitions or Recover Files and Save Partition Information. When a partition is found, it'll be displayed on the interface. Please judge whether it is correct before clicking "Reserve" or "Ignore" on the "Partition Found" dialog box. To judge whether the partition is correct, please check its information and files. You can browse and preview files without closing the dialog box. If it is the partition you want to recover, please click "Reserve" and the partition will be saved in memory not disk; if it is not the partition you are looking for, click "Ignore" to skip this partition. All these operations are just saved in memory and the searching process is read only. If all the logical partitions are the ones you want to recover, please click "Reserve" otherwrise click "Ignore". 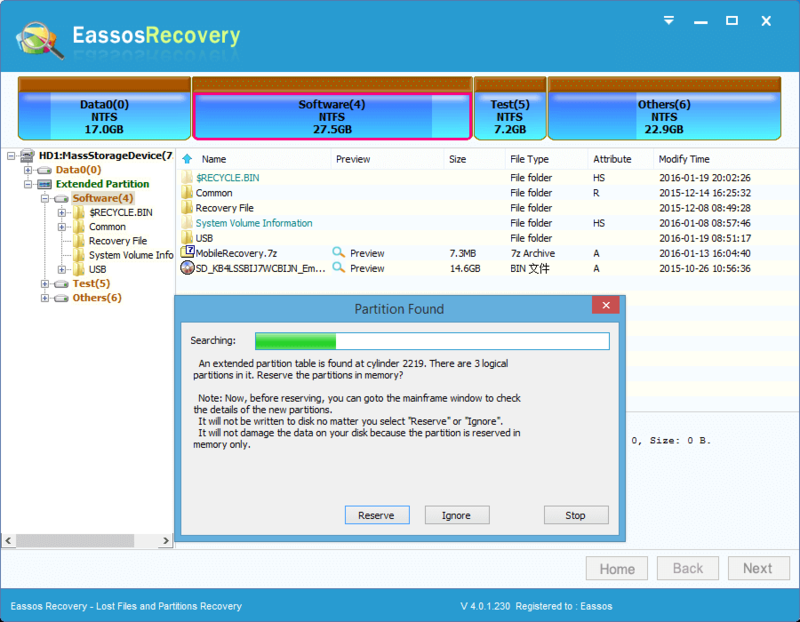 Eassos Recovery will search for every logical partition. 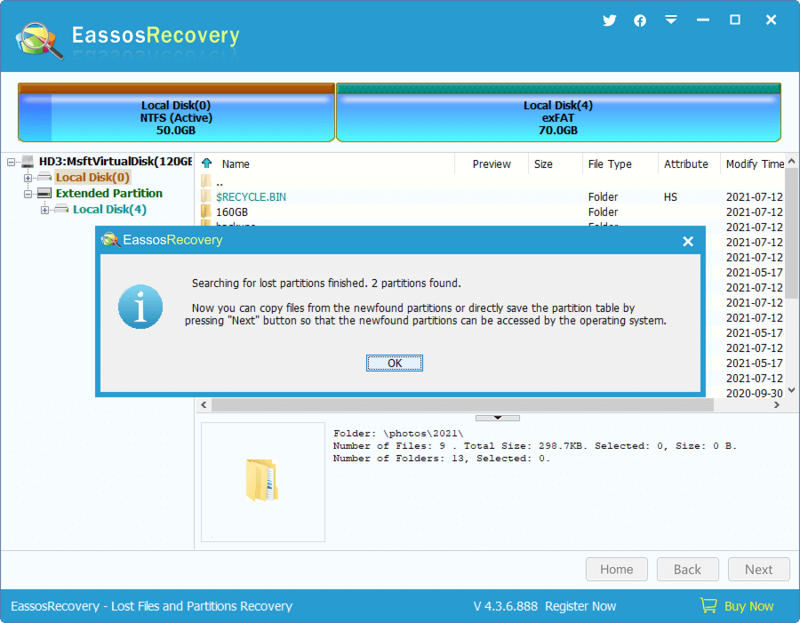 Most of the cases, Eassos Recovery can identify the partition is primary or logical, but it is not always right. You can assign the partition type according to your memory. There is a check box "This is a PRIMARY partition" or "This is a LOGICAL partition" on the "Partition Found" dialog box. You can check the option to correct the partition type. Finishing searching, Eassos Recovery will report the number of partition it finds out. Please click "OK" and you can check the partitions and their files. Besides, you can copy files by using the context menu. copy out some files through context menu. If all lost partitions have been found, please click "Next" to save partition table. Very Important: Before saving partition table, please make sure that all the partitions you want to recover and all the existing partitions you want to keep have been searched out. If your files are on those partitions which haven't been found, they will be damaged due to "Save Partition Table" operation. 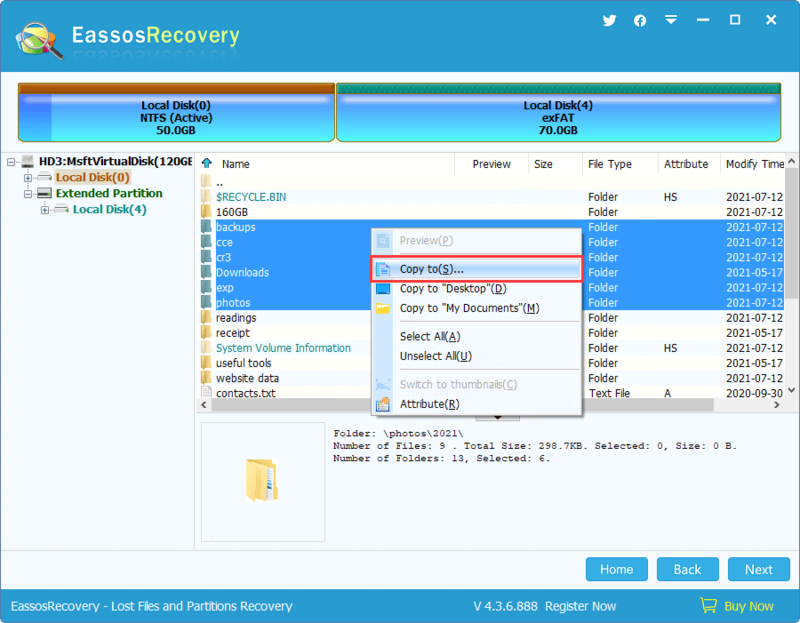 Eassos Recovery supports saving partition table as the traditional type MBR format as well as the GUID format. 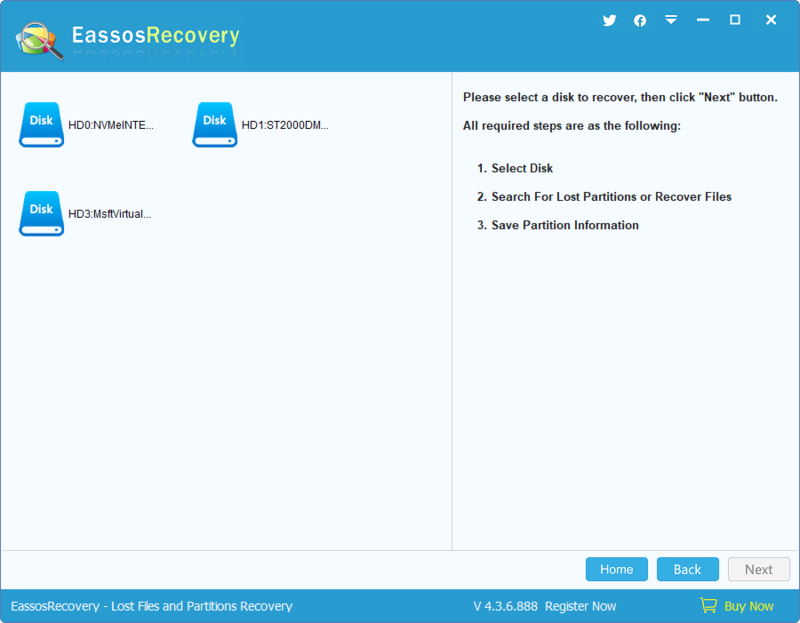 Before saving partition table, Eassos Recovery will select a partition table type according to the disk and its partitions. If it chooses the wrong partition table type, you can change it to the original type. To save the partition table, please click "Apply" button and the recovery result will be saved to disk. Then you can visit the partition and its files.